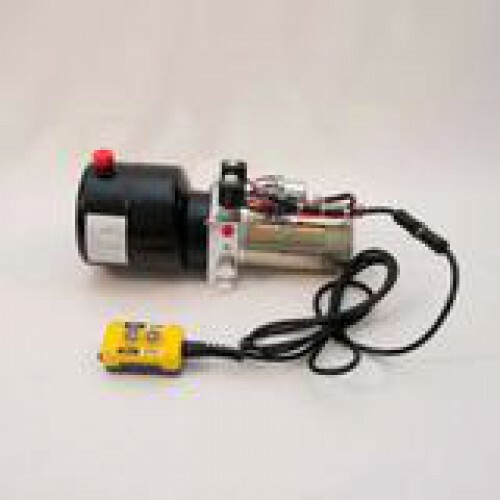 Tool-Tuff Double-Acting 12 Volt DC Electro Hydraulic Power Unit w/Remote, For Dump Trailer, DIY Hydraulic, Farm, Construction,etc! Equipped with a high pressure gear pump, a DC motor, a multi-functional manifold, valves and tank, this power unit has a power up - Power down circuit. Start the motor to lift the machine. Control raise and lower with cable controller It is widely used in tipper trailer, fork lift and scissor lift applications where the ability to apply hydraulic fluid pressure to both working ports of a cylinder is necessary. (instead of a "gravity down" system where the weight of the machine attached to the cylinder is enough to gravity feed down). There are unlimited uses for this product. These units are high quality and are used in many OEM applications. We have direct factory support for any questions or parts. Trouble shooting guide available upon request. ISO viscosity grades 22 to 46 are recommended. Anti wear, antifoaming & rust inhibitor additives are recommended. Do not use synthetic, biodegradable or water base hydraulic fluids. In most cases these fluids are not compatible with Buna O-rings. Please check fluid compatibility before use. Tractor hydraulic fluid is not recommended. Most tractor hydraulic fluid has to high of a viscosity & may not be compatible with Buna O-rings.